16’ by 30’ Great room addition to a 10 sided house overlooking Lake Champlain, built in 2007. 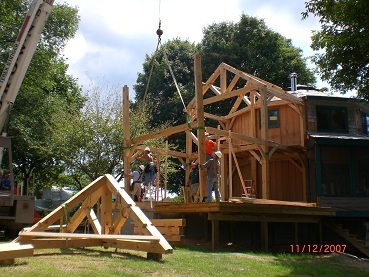 The timber frame addition ends in a half octagon which creates the very dramatic roof framing shown in the photos. A challenging project ! 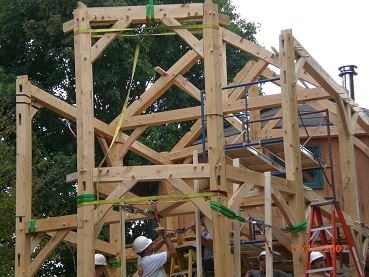 Hemlock timber frame with a natural oil finish. Based on a scale model developed by the client, we designed the foundation and timber frame, cut the intricate joinery and erected the frame on the new foundation. We also consulted on the structural insulated panel system. 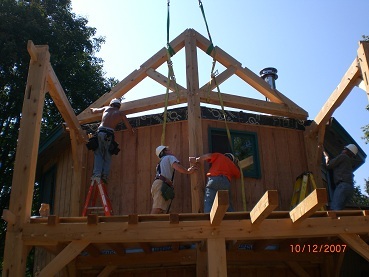 The addition was completed by the owner and local carpenters.